Welcome to the LitCharts study guide on Gregory Boyle's Tattoos on the Heart. Created by the original team behind SparkNotes, LitCharts are the world's best literature guides. A concise biography of Gregory Boyle plus historical and literary context for Tattoos on the Heart. A quick-reference summary: Tattoos on the Heart on a single page. In-depth summary and analysis of every Chapter of Tattoos on the Heart. Visual theme-tracking, too. Explanations, analysis, and visualizations of Tattoos on the Heart's themes. 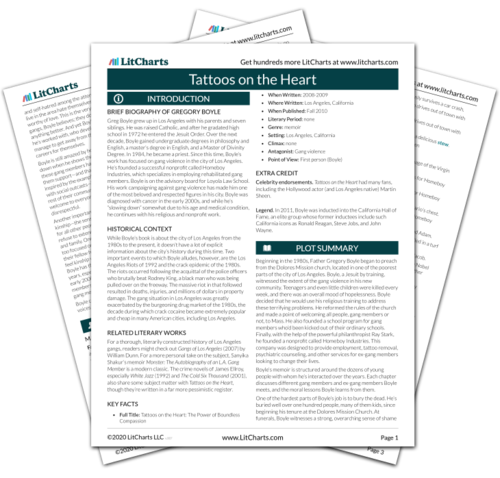 Tattoos on the Heart's important quotes, sortable by theme, character, or Chapter. Description, analysis, and timelines for Tattoos on the Heart's characters. Explanations of Tattoos on the Heart's symbols, and tracking of where they appear. An interactive data visualization of Tattoos on the Heart's plot and themes. Greg Boyle grew up in Los Angeles with his parents and seven siblings. He was raised Catholic, and after he gradated high school in 1972 he entered the Jesuit Order. Over the next decade, Boyle gained undergraduate degrees in philosophy and English, a master’s degree in English, and a Master of Divinity Degree. In 1984, he became a priest. Since this time, Boyle’s work has focused on gang violence in the city of Los Angeles. He’s founded a successful nonprofit called Homeboy Industries, which specializes in employing rehabilitated gang members. Boyle is on the advisory board for Loyola Law School. His work campaigning against gang violence has made him one of the most beloved and respected figures in his city. Boyle was diagnosed with cancer in the early 2000s, and while he’s “slowing down” somewhat due to his age and medical condition, he continues with his religious and nonprofit work. While Boyle’s book is about the city of Los Angeles from the 1980s to the present, it doesn’t have a lot of explicit information about the city’s history during this time. Two important events to which Boyle alludes, however, are the Los Angeles Riots of 1992 and the crack epidemic of the 1980s. The riots occurred following the acquittal of the police officers who brutally beat Rodney King, a black man who was being pulled over on the freeway. The massive riot in that followed resulted in deaths, injuries, and millions of dollars in property damage. The gang situation in Los Angeles was greatly exacerbated by the burgeoning drug market of the 1980s, the decade during which crack cocaine became extremely popular and cheap in many American cities, including Los Angeles. For a thorough, literarily constructed history of Los Angeles gangs, readers might check out Gangs of Los Angeles (2007) by William Dunn. For a more personal take on the subject, Sanyika Shakur’s memoir Monster: The Autobiography of an L.A. Gang Member is a modern classic. The crime novels of James Ellroy, especially White Jazz (1992) and The Cold Six Thousand (2001), also share some subject matter with Tattoos on the Heart, though they’re written in a far more pessimistic register. Celebrity endorsements. Tattoos on the Heart had many fans, including the Hollywood actor (and Los Angeles native) Martin Sheen. Legend. In 2011, Boyle was inducted into the California Hall of Fame, an elite group whose former inductees include such California icons as Ronald Reagan, Steve Jobs, and John Wayne. Arn, Jackson. "Tattoos on the Heart." LitCharts. LitCharts LLC, 17 Aug 2017. Web. 20 Apr 2019. Arn, Jackson. "Tattoos on the Heart." LitCharts LLC, August 17, 2017. Retrieved April 20, 2019. https://www.litcharts.com/lit/tattoos-on-the-heart.